By a cat’s whisker. That sums up the barely discernible distance between Beholder and Songbird at the finish line of the 2016 Breeders’ Cup Longines Distaff. Beholder was in front when the pair’s skirmish down Santa Anita’s homestretch ended at the wire. At 6 years old, the Distaff was Beholder’s last race. Hall of Fame Richard Mandella conditioned Beholder for her entire career and Hall of Fame jockey Gary Stevens was her pilot. The Distaff was Stevens’ 11th Breeders’ Cup career win, and Mandella’s ninth. Winning her third Breeders’ Cup race, Beholder joined the rarefied level of Goldikova. Beholder previously won the Juvenile Fillies in 2012 and the Distaff in 2013. Altogether, over four seasons Beholder raced 26 times, with 18 wins and six seconds. She was the Eclipse 2012 Champion 2-Year Old Filly, Eclipse 2013 Champion 3-Year Old Filly and Eclipse 2015 Champion Older Mare. It’s not a stretch to believe that Beholder will be in contention for further Eclipse Awards for the 2016 season, as well as an eventual place in the Hall of Fame. Right: MareMatch pedigree of Beholder and Uncle Mo. Courtesy of © 2016 Wek Thoroughbred Consultants. Retiring with a $6+ million dowry, Beholder will join the broodmare band at Spendthrift Farm, Lexington, Kentucky. Formalized plans have been announced, rest assured her connections had their choice of racing’s leading Lotharios. 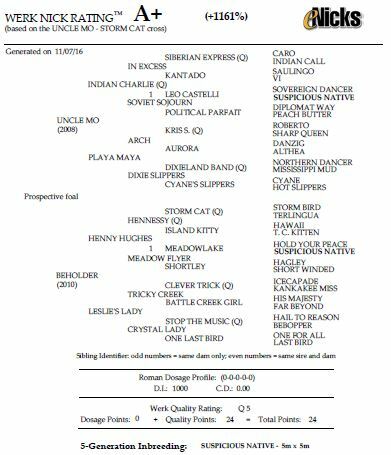 A quick look at Werk eNicks MareMatch pedigree analysis that lists top stallions in the United States and Europe as compatible including Tapit in Kentucky and Fastnet Rock in Ireland. That being said, Coolmore America has announced that Beholder is booked to visit their brilliant young sire Uncle Mo in 2017, for a 2018 foal. The pairing ranks high with MareMatch as well as with the physical traits and abilities of Beholder and Uncle Mo. Songbird‘s second place in the Distaff is the first time she failed to win. At 3 years old, half the age of Beholder, Songbird has run 12 times, winning 11 races and earning $3.7 million. Rick Porter, her owner, has indicated she will run in 2017. Depending on how she comes out of the Longines Distaff, Songbird could run in the new $12 million Pegasus World Cup at Gulfstream Park, Florida, on Jan. 28, 2017. Porter is no stranger to bringing along a maturing filly. His Havre de Grace was a major 3-year-old filly. In 2011, as a 4-year-old Havre de Grace took on the “boys” winning the Grade 1 Woodward Stakes at Saratoga and earning the Eclipse Horse of the Year title. Beholder’s win in the Longines Distaff earned Rick Porter $1,100,000. Her connections received the Distaff trophy and timepieces from Longines. Typically, the winning trainer and jockey each receive 10% of the purse. The team back at the barn may also earn a percentage. The 2016 Breeders’ Cup Longines Distaff, held over 1 1/8 miles, clocked in at a reasonable 1:49.20. Beholder paid $8.60 to win. The Beholder-Songbird exacta paid $12.60. The trifecta of Beholder-Songbird-Forever Unbridled paid $40.40.